• Gurudev krpa-bindu diya • Sri Krishna Chaitanya Prabhu daya kara more • Ei-bara karuna kara Vaisnava Gosai • Akrodha paramananda Nityananda Raya • Yadi Gaura na ha'ta tabe ki ha-ita • Hari Haraye • Hare Krishna maha-mantra. An ePub file for offline reading on mobile phones and tablets containing the lectures of His Divine Grace Om Vishnupad Srila Bhakti Nirmal Acharya Maharaj published here from January to March 2019. We pray this serves as a source of guidance, nourishment, and life to all the devotees and well-wishers worldwide. All the previous Guidance issues, containing over a thousand lectures spoken by His Divine Grace, are available for download from the Library section of the website. Vaishnava iCalendar is prepared and now available for download and upload on Apple mobile devices (iPads, iPods, iPhones, MacBooks, etc.). On computers: download and launch. On mobile devices: upload by clicking on the link above, through iTunes synchronisation or email. !Alert times have been updated. Guidelines on how to observe and honour this holy day: Ekadasi takes an indispensible part in the life of a sincere practitioner. At Sri Chaitanya Saraswat Math, Ekadasi and paran are observed with affection and without fail according to the dates given in the Calendar. "One day, Gaurahari left the Gundicha Temple and sat in the Jagannath Vallabha garden. It was pure Ekadasi, and the Lord spent the whole day and night chanting the Name of Krishna..."
"I carefully observe the holy days related to Madhava, they are the mother of devotion." "On the holy day of Sri Hari, Sriman Mahaprabhu, the life and soul of the universe, began dancing..."
Devotees share photographs from the auspicious programme on the holy ekadasi tithi: "Madhava-tithi bhakti-janani yatane palana kari. I carefully observe the holy days related to Madhava—they are the mother of devotion." "The joy of devotion to Gaura will arise within the heart of those who read this Sri Navadvipa-bhava-taranga with faith. Sri Svarup Damodar will bless them, accept them within his group, and give them the shade of his feet." His Divine Grace Om Vishnupad Srila Bhakti Nirmal Acharya Maharaj started preaching in Uluberia over twenty years ago, in 1990s, with just a handful of devotees. Since then, His Divine Grace brought innumerable devotees to the holy lotus feet of Om Vishnupad Srila B.S. Govinda Dev-Goswami Maharaj, and the Uluberia community of devotees has grown into several hundreds of members of Sri Chaitanya Saraswat Math family, many of whom we have had the fortune to meet during the main festivals of the Math. Following the mood of Sriman Mahaprabhu (who would appoint devotees as leaders, or 'gurus' of their locality—'yare dekha, tare kaha 'krsna'-upadesa amara ajnaya guru hana tara' ei desa'), His Divine Grace calls Sri Rama Krishna Prabhu (a disciple of Srila B.R. 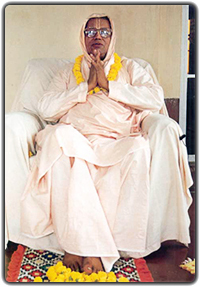 Sridhar Dev-Goswami Maharaj) the 'Guru' of Uluberia. This year His Divine Grace has finally shed his causeless and inconceivable mercy onto this community and inaugurated the construction of the long-awaited Temple of Sri Chaitanya Saraswat Math. The delight of the devotees went so far that they actually themselves partake of the construction service along with the hired workers. We are honoured and happy to share the first photographs from the site. "Are Krishna and Gaura separate entities? Who came first, Sri Krishna or Sri Chaitanya? Why is it a disturbance to worship Gaura and neglect Krishna, or worship Krishna and neglect Gaura? In what plane do the associates in the Pastimes of Sri Gaura and the associates in the Pastimes of Sri Krishna reside together?" "Sri Gaudiya Math's Dham-parikrama invites everyone to try for that, to try to acquire that wealth. However small, or of whatever character it may be, its object is connected with that highest plane given by Mahaprabhu Sri Chaitanyadev, the Lord of love and the distribution of love." "Disrespecting Sri Guru and the sadhus, who are the revealers of the Dham. Considering the Dham temporary. Residing in the Dham and engaging in mundane activities. Considering the glories of the Dham exaggerated praise or imaginary..."
"Dham lit. 'abode'; the homeland of the Supreme Lord where He performs His eternal Pastimes; a plane existing in the spiritual world that appears within the material world when the Lord descends to perform Pastimes." The map and legend (including their footnotes) presented here have been reconstructed from Srila Bhakti Vinod Thakur's 1888 publication of Sri Nabadwip- dhama-mahatmya and translated into English. Their size, proportions, and content have been preserved according to the original as far as possible. His Divine Grace Om Vishnupad Srila Bhakti Nirmal Acharya Maharaj travels to Sri Ekachakra Dham to supervise the progress of the ongoing construction. Sharing the photographs from the outbuilding kitchen site and more good news. His Divine Grace Om Vishnupad Srila Bhakti Nirmal Acharya Maharaj gives initiation to a new member of Sri Chaitanya Saraswat Math and having checked the construction leaves in the early morning for a number of other places. After many years of earnest hankering and untiring effort, Sripad Sunil Prabhu of Shimulia has succeeded in rendering a grand and very magnanimous service to His Divine Grace Om Vishnupad Srila Bhakti Nirmal Acharya Maharaj: His Divine Grace comes to Shimulia to supervise the already ongoing construction of Sri Chaitanya Saraswat Math temple on the land donated by Sripad Sunil Prabhu. We are honoured to be sharing a few glimpses from the site. Continuing his way, His Divine Grace then visits Sri Nrisigha Palli temple (we are happy to give more good news coming from the temple there), and after that briefly visits Ladies' Ashram in Kalna on the way back to Kolkata. Srila Bhakti Kusum Ashram Maharaj takes the devotees in Kolkata out to downtown Kolkata for preaching and book distribution. Sharing photographs from a lively nagar-sankirtan. His Divine Grace Om Vishnupad Srila Bhakti Nirmal Acharya Maharaj and Srila Bhakti Kusum Ashram Maharaj, accompanied by fortunate devotees, participate in a large preaching programme organised by the devotees in Bakultala and Bhatnagar. "Who can give the right to serve Srimati Radharani, or Krishna also? Krishna is the property of Srimati Radharani and Srimati Radharani is non-different from Gurudev. So, if we properly surrender to the Guru, Gurudev can give us the permission, Gurudev can give us the right to serve the Lord." -The calendar will appear in your Google Calendar under "Other calendars"
-Final step, on your phone: synchronise your google account calendar in the settings of your phone. Restart your phone if the Calendar events do not appear immediately. Note: the calendar has notifications set for the major dates, but you need to see the calendar settings in your phone to make sure you get these notifications. You can also receive notification by email, see the settings in your online Google calendar. -Wait for a pop-up window, tap "add all" on top. All calendar events should be added to your calendar smoothly. Note: The permanent online link to to the offline calendar for mobile devices, the Ekadasi list, Bengali calendar and the Ekadasi list in Bengali, as well as the online calendar is in the top menu of the website. His Divine Grace Om Vishnupad Srila Bhakti Nirmal Acharya Maharaj and Srila Bhakti Kusum Ashram Maharaj arrive in Tarakeshwar to observe the forthcoming festivals of Sri Rama Navami and the holy disappearance day of Srila Bhakti Sundar Govinda Dev-Goswami Maharaj in the loving company of fortunate devotees and well-wishers. • Revealed Truth • The Wonderful Nature of the Vaisnava • Life's Destination • Divine Message • The Math Logo • Poem "A Wish"
All these books, as well as other publication from Sri Chaitanya Saraswat Math, are available for purchase at our main temples in India, as well as ONLINE from any country all over the world. "This animosity, these things have not grown overnight—it has been growing and increasing day by day, day by day. You did not see what was happening inside, and now that tree has grown very big!" Photographs taken during the evening programme at Sri Chaitanya Saraswat Math, Tarakeshwar: His Divine Grace Om Vishnupad Srila Bhakti Nirmal Acharya Maharaj speaks online to the devotees in Ecuador giving six initiations, and later gives class, together with Srila Bhakti Kusum Ashram Maharaj. "O Hari! O Kesava! O Lord of the universe! You have assumed the form of Ramachandra! All glory to You! During the battle at Lanka You distributed to all the directions the most pleasing, crowning offering of the ten heads of Ravan, which were desired by the guardians of the directions." • "Lord Ramachandra became King during Treta-yuga, but because of His good government, the age was like Satya-yuga. Everyone was religious and completely happy." • "He was a saintly king, and everything in His character was good, untinged by qualities like anger. 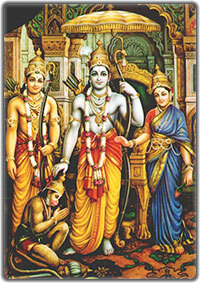 He taught good behavior for everyone, especially for householders, in terms of varnasrama-dharma. Thus He taught the general public by His personal activities." "He may not be able to talk now like before, but he can see everything, and he is watching everything. I think those who say Gurudev is not here anymore have not got any connection with Gurudev. That is why it is necessary to have a strong faith." The holy day of Sri Rama Navami day passes in various services around the temple and Hari-katha: devotees prepare decorations, arrange the kitchen for the festival while the new kitchen and goshala construction is proceeding swiftly. "I want to go somewhere—I want to get some relief. When I am sitting in the office, I get some relief, but as soon as I go to my room, I again start remembering everything. I want to forget it, but I cannot... It is impossible to forget this. Such is my situation." "We always remember Srimati Radharani, Her associates and other Vraja gopis, but we forget about Nanda Maharaj and Mother Yasomati. It has come out of Radharani's mouth: 'We do not consider our heart's pain, but when we see Mother Yasoda's face and Mother Yasoda's situation without Your presence, our heart is breaking after breaking after breaking.'" "I offer my obeisance unto he who perfectly fulfils his Gurudev's most cherished desires; who is fully adorned with the blessings of his Gurudev’s associates; who is expert in all aspects of Vedic knowledge, both conceivable and inconceivable; who is the pre-eminent follower of Srila Rupa Goswami Prabhu's line; who is known as 'Govinda'—Srila Bhakti Sundar Govinda Dev-Goswami Maharaj; whose beautiful, effulgent, exalted form is infused with pure devotion; who is the Guru of the entire universe; and who is the giver of the seed of divine love for the Supreme Lord." "If you follow your Guru's instruction, if you fulfil his desire, even after his disappearance, if you always think what will make him happy, then you will get his association, you will feel joy..."
"Our supreme Gurudev, Om Vishnupad Jagad Guru Srila Bhakti Sundar Govinda Dev-Goswami Maharaj accepted this day as the day to leave this world for his eternal abode, and he has left us, fallen souls, here to chant his glories..."
"Sacrificing his own life, forgetting his own happiness and comfort, Gurudev would go door to door preaching the message of Mahaprabhu: be merciful to the souls, chant the Holy Name, and serve the Vaishnavs. Besides this, there is no other religion." "Gurudev's disappearance festival means Vaishnav seva. Vaishnav is the main focus for us. Appearance and disappearance look different, but following Vaishnavs' vision we think that on these two tithis Gurudev always takes worships from us." A page of the Daily Practice section dedicated to Vaishnav-seva and observing festivals. "Why are you making a festival? Making a festival means you are inviting many people and you are giving them some prasadam, engaging them in Krishna consciousness—it means practising Krishna consciousness." "You may have everything, but if you do not have mercy of your Guru, then you have nothing. Gurudev gave you all his blessings, and if we can serve him, we will get supreme benefit. You must always live remembering Gurudev's words." "The lotus feet of Sri Rupa Manjari are my wealth, my bhajan (service), my puja (worship), the wealth of my life, and whatever ornaments I may have. Her lotus feet are the very life of my life..."
"I will break my head on a rock, I will enter into fire! Not finding the association of Sri Gauranga, who performed His Pastimes with all these associates, Narottam Das weeps." "I have offered everything at Your feet and taken shelter in Your home. You are my Master; please consider me Your dog. I will never think about my own maintenance; I will always remain within the shelter of loving attachment for You." "All glory to the effulgent arati of Srila Gurudev taking place at the foot of Govardhan for the beneft of the world!" A glorification article that sprang forth from the interpretation of the Pranam-mantra of His Divine Grace and was originally published as an Appendix to the Revealed Truth. Pages containing the verses that were selected to adorn the samadhi-mandir of His Divine Grace Om Vishnupad Jagad Guru Srila Bhakti Sundar Govinda Dev-Goswami Maharaj. May these pages please and nourish the Vaishnavs' hearts. This year, the holy disappearance day of His Divine Grace Om Vishnupad Srila Bhakti Sundar Govinda Dev-Goswami Maharaj is manifest on an ekadasi fasting day that is why the fortune is such that the festival is observed during three full days this year. Sharing photographs taken during the final, third, day of the festival adorned with many auspicious services culminating in a grand and auspicious Vaishnav seva. The grand festival in honour of the holy disappearance day of His Divine Grace Om Vishnupad Srila Bhakti Sundar Govinda Dev-Goswami Maharaj is spent beautifully at Sri Chaitanya Saraswat Math in Sri Tarakeshwar, at the holy feet of Sri Taraknath (Lord Siva). By the infinite mercy of His Divine Grace Om Vishnupad Srila Bhakti Nirmal Acharya Maharaj, fortunate devotees spend this day in service and association of holy Vaishnavs. Sharing photographs from Sri Chaitanya Saraswat Math, Tarakeshwar, taken during the eve of the holy disappearance festival of His Divine Grace Om Vishnupad Srila Bhakti Sundar Govinda Dev-Goswami Maharaj, observed by the devotees in the shelter of the holy lotus feet of Om Vishnupad Srila Bhakti Nirmal Acharya Maharaj and the association of dignitary Vaishnavs.